License plates from Texas can be obtained from the Department of Motor Vehicles. It is possible to apply for specialty, disability, or temporary plates in addition to the state’s standard license plate. Most Texas license plates can be personalized to have a custom plate number. Texas residents can apply for license plates at a Department of Motor Vehicles (DMV) office. New residents with an out-of-state vehicle must register within 30 days. Also, residents who purchase a new or used vehicle must register within 30 days. All vehicles must have license plates when being operated in the state of Texas. For cars, vans, and trucks, license plates are required at the front and rear. For motorcycles and trailers, it is only necessary to have license plates at the rear. There are a variety of license plates in texas in addition to the standard license plates. The standard issued plate by the DMV in taxes has a white background with black lettering. Temporary license plates are required to drive legally while completing the registration process for a vehicle. If you purchase a vehicle from a private seller, you must obtain temporary plates in advance from an authorised provider (i.e. a Texas DMV office or car dealership). Purchasing a vehicle from a dealership often includes temporary plates provided by the dealer. Temporary license plates in Texas are valid for 5 days. To obtain a specialty license plates, you can apply online, by mail, or in person (when you register your vehicle). A complete list of specialty plates along with their fees can be obtained from your local DMV office. Personalized plates require approval from the DMV before being issued. If approved, there are additional fees for registering these plates. If you are the owner of another vehicle or purchase a new vehicle, you can transfer your license plates for free. The vehicle you are transferring your plates to, whether owned or leased, must be in your name. It is not possible to transfer license plates from one owner to another. If you do not require your license plates, they must be surrendered to the DMV. Plates can be surrendered by mailing or bringing them in person to DMV office. If your Texas license plates are lost, damaged, or stolen, you must obtain replacements from the DMV. Note: Old and faded license plates must also be replaced to ensure your plates are visible on the road. You should receive a notification in the mail well before the registration for your vehicle’s license plates expire. Once your renewal has been processed, you’ll receive new registration stickers to apply to your rear license plate. Not shown are taxes, service fees, and any other fees required to obtain and maintain your license plates. Fees vary by plate type and vehicle. To obtain an estimate for registering your vehicle, contact a DMV office in your county. You can look up license plates in Texas using the search bar above. After submitting either your desired plate number, you can learn whether the plate number you want for personalization is available or not. 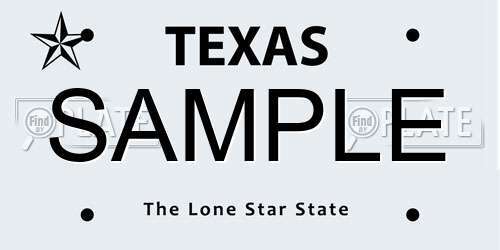 FindByPlate offers you with a free search tool to look up license plates in Texas and any other state in the U.S.